Unspun isn’t let out of the office often and Tuesday was an one of those exceptions. 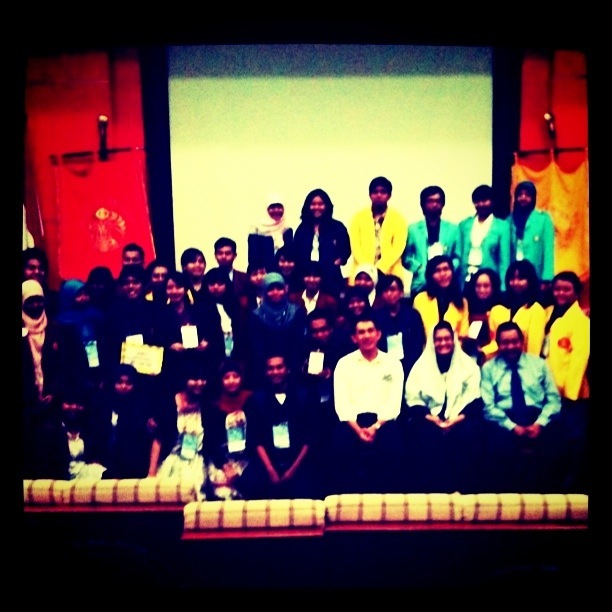 The occasion was PRVaganza, a day in Communication Week 2011 or Pekan Komunikasi 2011 hosted by FISIP (Social and Political Faculty) University Indonesia in Depok. The theme this year revolved around Social Media. There were three main events that day. The first was with a Seminar themed “Social Media Relations : Bringing Your Brand To Life” featuring as speakers one of the doyennes of Indonesian PR, Magdalena Wenas, Devi Rachmawati from UI, Aurellio Kaunang, the media relations Manager of Unilever, and Unspun. The speakers spoke about how PR has transitioned from 1.0 to 2.0, how social media could be used for crisis and issues management and the incredibly hip and suave Aurellio spoke about how his organization used new media to connect with customers. Unspun cautioned that the euphoria with social media should be taken in stride. Rather than jump into a social media campaign, PR professionals should pause to get their strategy right before even thinking which social media channel they should use. We had a great moderator in Muhammad Daud and our liaison for the event, Ira Ratna Juwita was simply superb in attention to details and keeping all of us up to date with developments. There were some hitches but overall the organizing committee did a good job, much better than some EOs that Unspun’s known. The second event was Pecha Kucha featuring a host of PR professionals from consultancies as well as organizations speaking on the theme: My Workplace, My Web. This struck me as a good idea as the students right now have very little idea what the organizations they will likely be working in are like. Unspun was very proud of Hanny Kusumawati from Maverick (OK, I’m biased) who shared with gusto what her workplace was like, from having cool clients you can go clubbing and hanging out with (Brand A) to, the food obsession that marks each office day, the annual lively themed media gathering, the annual office overseas outing trip, the Personal Development Fund (you get, after working in Maverick a year, up to a month’s salary to do a course or travel anywhere you haven’t been to just to develop yourself as a better human being), the laptop ownership scheme (the office subsidizes you Rp5 million to buy a laptop, and if you don’t have the money we’ll give you an interest free loan), and a host of fun activities. Overall, however, the Pecha Kucha was enlightening as always and the audience learned a lot of things they did not know before. The third event for the day, which stretched into the night was the PR Competition – where a shortlist of 15 university teams from throughout the country competed in a PR Proposal writing and presentation contest. In keeping with the theme, they had to handle a Social Media Crisis. There were three judges, including Unspun, and we had to sift through the 15 written entries to come up with a list of 5 finalists, who then had to present their proposal to the jury. The team from University Padjajaran came up tops as they showed a very good understanding of the channels of information and influence online and offline. In second place was the team from University Diponegoro and in third place was one of the teams from University Indonesia. All the teams, however, suffered from a lack of clarity when it came to defining their objectives and strategy. Where the objectives were concerned they usually stopped at a cosmetic and superficial achievement rather than what concrete results an effective communications strategy could achieve. And where strategy was concerned all of them mistook tactics for strategy. It would have been depressing except for one student whose team did not make it to the finals. Unspun forgets which university he was from but during a break in the judging he came up to Unspun, qualified that he was not seeking to win but merely wanted to know, showed Unspun the team’s proposal and asked what was lacking in it. Unspun shared with him what he always tells the newbies in his office attempting to write a proposal: To define your objective ask yourself ‘what would have changed or achieved if my PR program was 100% successful?‘ The answer is usually your objective. Strategy is a bit more tricky but the crux of it is that a strategy statement has to be about an action plan to achieve a major goal, not a single action to achieve a limited goal. That is a tactic, like “open a FB page,” “twit about the issue” or “call a press conference”. Unspun didn’t get his name and am now regretting it because in that young man lies the spirit of inquiry that is at the heart of all learning. Unspun left the UI campus at depot uplifted.